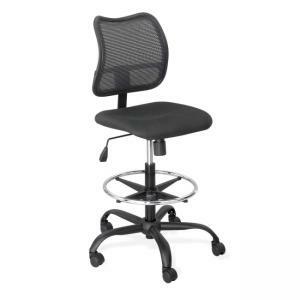 Extended-height mesh chair features black mesh fabric back, a black polyester fabric seat and a footring. Comfortable, ergonomic, height adjustable seat is designed for all-day comfort and prevents fatigue. Chair holds up to 250 lb. Seat height adjusts pneumatically from 23" to 33". Seat size is 18" wide x 17-1/2" deep. Back measures 17" wide x 15-1/2" high. 25" five-star base has 2" hooded dual-wheel carpet casters. Loop arms are sold separately. Chair meets applicable ANSI/BIFMA standards.